Napa Home & Garden continues to offer our popular FLAT RATE SHIPPING PROGRAM based on your order total. These rates apply to all merchandise shipped to a destination within the continental United States. New Freight Cap for Zone 4 & Zone 5 customers! Effective immediately, we're pleased to announce a FREIGHT CAP of 15% for all orders of $1,500 or more in shipping zones 4 & 5. This freight cap applies to the initial shipment and back order. Now more than ever, the bigger the order the better the shipping rate. STEP ONE: Write your order. STEP TWO: Use the map on this page to find your Shipping Zone. 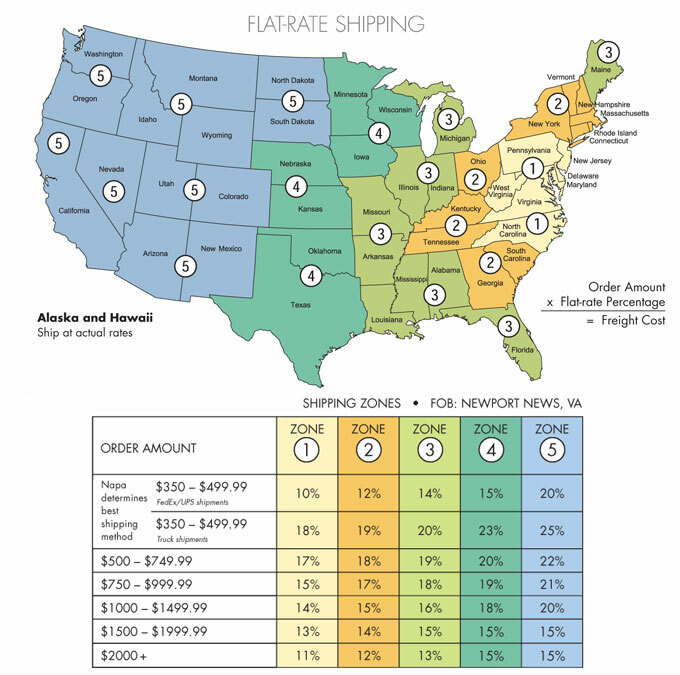 Use your Order Amount and your Shipping Zone to find your Flat-rate Percentage on the chart. STEP THREE: Apply this percentage to your Order Amount. It’s that easy to know your shipping costs. The Napa Flat-Rate Shipping guarantee applies when Napa selects the method (truck or ground) and the carrier. NOTE: Customers who direct Napa to ship orders via ground when their orders are best shipped by truck will have the following charges added to their invoice: actual freight + labor to repack items for ground shipping + materials & handling. For delivery to high-freight destinations (restricted areas, remote locations) actual freight rates apply. Napa offers a generous freight cap to our customers in major Canadian markets. Add 25% for door to door delivery which includes freight, duty and brokerage fees. We take care of everything! No broker required. Minimum order $1,000 on in-stock merchandise to qualify for the Canadian Freight Cap. Assessorial charges/services are extra, see next paragraph. We contract with LTL freight carriers and ground transportation for standard commercial delivery only. Our freight rate program does not include additional assessorial services. Residential delivery or white glove services (such as inside delivery, re-delivery, call for appointment, lift gate, delivery within city limits [NYC], ferry charges, etc.) will incur additional charges. If you advise us when placing your order that you require additional shipping services, Napa will prepay and bill you. Services used without Napa arranging in advance will be billed separately by the carriers. In an effort to keep shipping costs low, many of these published freight rates reflect a subsidy by Napa Home & Garden. In some cases, Napa pays a subsidy as high as 20% of the order value! On the rare occasion that actual freight exceeds the published rate plus Napa’s maximum 20% subsidy, we will ask the customer to pay the excess above 20%, increase the order or cancel the order. Napa is committed to excellent customer service, which includes stocking sufficient inventory to fill all orders. We back up this commitment by honoring the published freight rate for backorders. Backorder example: a customer in Zone 3 who orders $1,000, but we only fill $800 initially, would pay 15% of $800 (or $120) for freight on the initial shipment; and only 15% on the remaining $200 (or $30) on the backorder shipment. Actual freight rates apply plus $20 handling fee. If a customer requests to receive a backorder below $150, actual freight rates will apply plus $20 handling fee. Effective immediately, Napa will no longer extend our guaranteed freight rate on any order that contains 50% or more in dollar value of Napa Last Call (discounted) items. Orders with 50% or more in dollar value of discounted items will ship at actual freight rates.